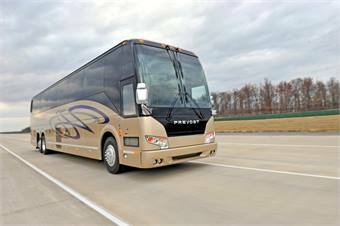 Prevost donated a 2013 H3-45 motorcoach to the American Bus Association Foundation Live Auction, which will be held Sunday, January 6 at ABA Marketplace 2013 in Charlotte, N.C. The 2013 H3-45 motorcoach is equipped with a fuel-efficient Volvo D13 engine and Volvo I-Shift transmission as well as safety features including Prevost Electronic Stability Program, fire suppression and tire pressure monitoring system. Additionally, the coach features the Prevost Liaison telematics system, 56 seats with standard three-point seat belts, Prevost Radio and Premium Sound System with an iPod connection, 15-inch widescreen monitors, dual 1800 watt inverters, closed parcel racks, LED reading lights and 110-volt electrical outlets at each seat. Donations to the Foundation Live Auction, such as the brand new H3-45 by Prevost, help support ABA scholarships, industry research and educational programs. The ABA Foundation has awarded nearly 200 scholarships worth over $600,000 to industry families. The ABA research program has invested nearly $400,000 to show the societal impact of motorcoach travel and tourism.